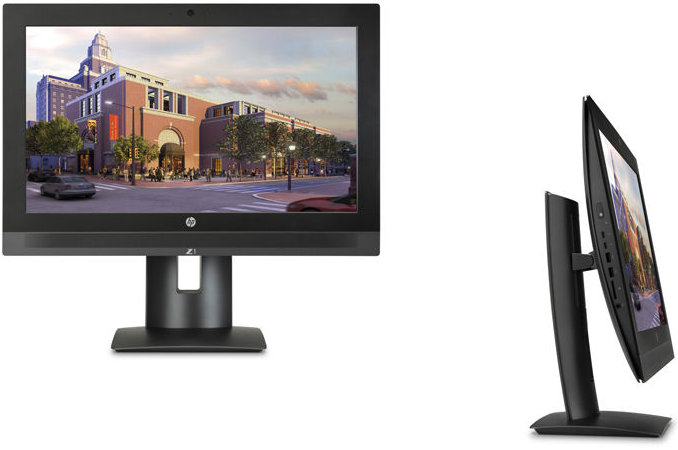 HP last week introduced its third-generation HP Z1 all-in-one workstation. The new system offers higher performance than its predecessor as well as a 4K resolution display. The new Z1 is also significantly more compact compared to prior two generations of HP’s Z1 machines, but retains upgradeablility and a serviceable design. In a bid to make the system smaller and slimmer, HP had to shrink the size of the display and move to a purely M.2/2.5-inch storage platform. The HP Z1 G3 AIO workstation features 23.6” IPS display panel with 4K (3840×2160) resolution at a 60 Hz refresh rate, a rated 300 nits maximum brightness, 1000:1 contrast ratio as well as 178°/178° horizontal/vertical viewing angles. For comparison, the first and the second generations of HP’s Z1 featured 27” monitors with 2560×1440 resolution, but with the new incarnation of its AIO workstation the company preferred to install a smaller display panel to make the system more compact, increasing the PPI from 108.8 to 186.7. 1 x mSATA SSD 2 x 2.5"
The new HP Z1 G3 is based on the Intel Xeon E3 v5/Core i3/i5/i7-series (Skylake) processorsas well as the Intel C236 PCH (platform controller hub). The new AIO workstation can be equipped with up to 64 GB of DDR4-2133 SO-DIMM memory (ECC is supported only by the Xeon and the Core i3 CPUs), up from 32 GB of DDR3 supported by the previous-gen model. The graphics sub-system of the new HP Z1 G3 relies on either Intel’s HD Graphics 530/P530 cores (Gen 9, 24 EUs), NVIDIA’s Quadro M1000M 2 GB (512 stream processors) or M2000M 4 GB (640 stream processors) professional graphics adapters. Since the predecessors of HP’s Z1 G3 relied on low-power professional graphics adapters from NVIDIA in MXM 3.1 form-factor, it is not surprising that the company decided to install similar cards this time. Storage in the HP Z1 G3 is something that was significantly redesigned compared to previous generations. The new workstation supports up to two 2.5” HDDs or SSDs with SATA 6 Gbps interface as well as up to two HP Z-Turbo Gen 2 NVMe SSDs in the M.2 2280 form-factor and both with PCIe 3.0 x4 interface. As a result, the Z1 G3 has inherently faster storage system than its predecessors (which did not support PCIe 3.0 SSDs), albeit without the opportunity for a large 3.5-inch mechanical. When it comes to storage space, not everything is that easy. HP itself installs SSDs and HDDs with up to 1 TB capacity, hence, it can equip its Z1 G3 machine with up to 4 TB of storage. However, since there are M.2 SSDs and 2.5” HDDs and SSDs with over 1 TB capacities, end-users could install such drives themselves due to tool-less upgrade and maintenance capabilities. Hardware RAID is supported only for 2.5” HDDs and not everything is clear with software RAID for M.2 drives. Moreover, the system no longer has an internal optical drive. As for input/output capabilities, the new HP Z1 supports two Thunderbolt 3 ports (the number of controllers is unknown, could either be one controller per port or one controller for both) to connect USB-C and TB3 peripherals as well as external displays. There are also six USB 3.0 ports (one supports charging), one SD 4.0 media card reader, a DisplayPort 1.2 connector and a TRRS connector for headsets. Networking and wireless capabilities look standard for today’s workstations: one Intel I219LM Gigabit Ethernet controller as well as one Intel 8260 Wi-Fi 802.11ac with Bluetooth 4.2 module (installed into its own M.2 slot, thus, does not impact storage options). The system also has four internal stereo speakers with DTS Studio Sound software enhancement. 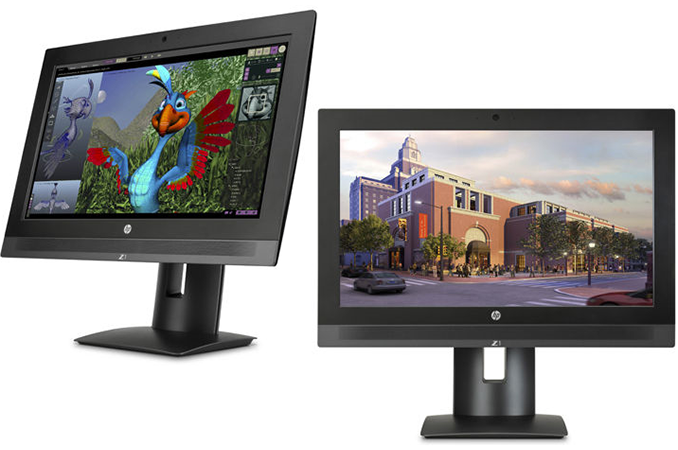 HP announced its first-generation Z1 AIO workstation back in early 2012. The machine was based on the Intel Xeon E3 v3 or the Intel Core i3/i5 processors (Ivy Bridge), NVIDIA’s mobile Quadro graphics and featured a 27” display panel, an optical drive (or an optional Thunderbolt module) module, desktop-class DDR3 DIMMs, SATA HDDs and so on. The HP Z1 G1 received the first ever 10 out of 10 AIO repairability score from iFixit because it was possible to replace all internal components (even its display panel) fairly easy. The downside of Z1’s architecture was its weight and cost. The maximum weight of the system with stand was around 21.3 kilograms and the cost started at $1899. The HP Z1 G2 followed its ancestor in many ways. However, its weight was still around 21.3 kilograms and the price started at $1999. When designing the third-generation of its Z1 workstations, HP engineers tried to make the system lighter, thinner and more affordable. They decided to go with a smaller (yet, higher-resolution) display panel, SO-DIMMs rather than full-sized memory modules, removed the optical drive and also lost the 3.5” HDD bay. The result is evident: the system weighs 10.51 kilograms and is two times thinner than its predecessors. The cost of the workstation starts at $1498 in its basic configuration, which is lower compared to the Z1 and the Z1 G2. HP advertises tool-less upgrades and maintenance, but it remains to be seen whether the Z1 G3 is as easy to repair as its predecessors. 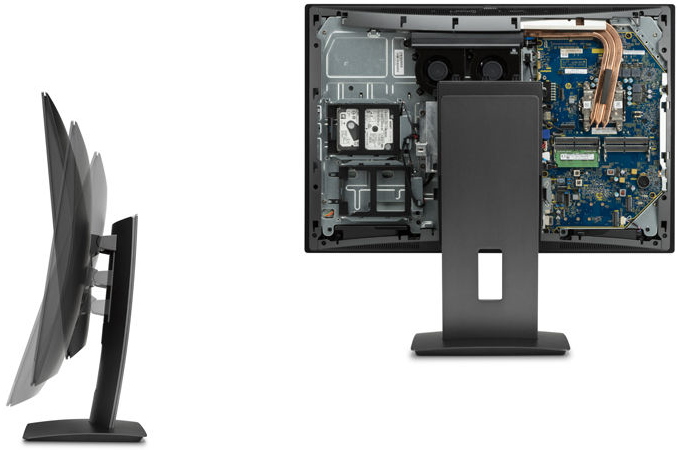 The HP Z1 workstation will be available from May. Looking at pictures of the G1 it feels like the bezels were slimmer, and that design was already old(ish) 4 years ago. Most MIL-810G spec devices have thick bezels...it's basically a requirement to survive the 3 foot x 30 on all sides impact test. Does the Z1 meet MIL-810G specifications? As far as I know only the ZBooks passed a few of the tests and it's mostly for the marketing guys to sell it as a "fun fact". HP considers it unfit for military use. And I can tell you for a fact that the Z1 G1 did NOT survive the kind of impact you're talking about. I've seen plenty of cases where people "popped the hood" to show off for others and when closing it back they pushed it off the table with unfortunate consequences. zBook 14 is based on the elitebook 840, zBook 15u is based on the 850, both 840/850 meet 8 of the 10 criteria for MILSTD 810G, only failing one of the two particle tests and obviously failing submersion, although they have IP44 rating for dust and water resistance. 810G requires IP56 or better. zBook 17 is questionable. The Z1 meets 4 of the 810G criteria and vibration and impact are two of them. It should have no trouble falling off a table and surviving. The entire frame is magnesium reinforced (the subframe is shown in the photo above) but I agree the bezel is also partially designed that way for the maintenance hinge.